Did you catch yesterday's Brands I Love: Free People Part 1 post? If not, you can click here to check it out. I talked about my number 1 favorite Free People top yesterday and several favorite dresses. Today I'm sharing the rest of my Free People tops, which are my very favorite tops for fall and winter. Some of the price points are a little higher than I typically like to spend. However, items made by this brand are the best quality and will last you years and years and years! 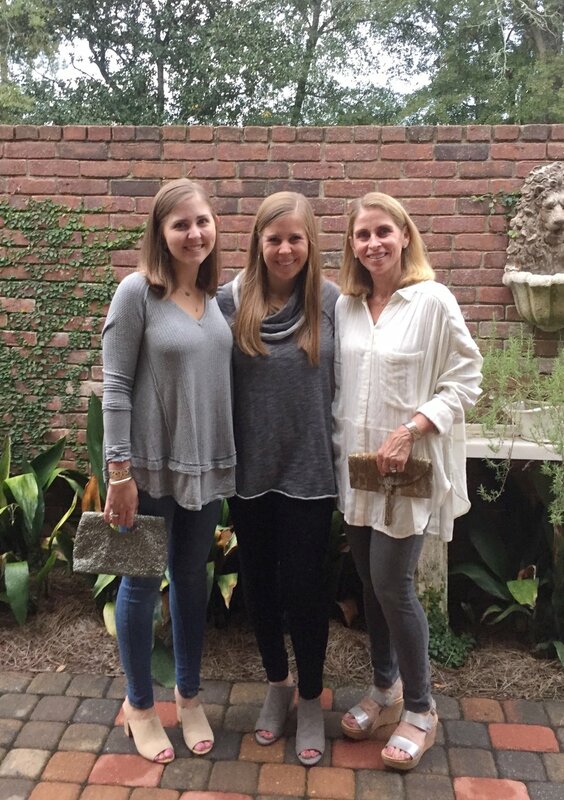 Also, thanks to my mom and sister for taking pictures with me, and thanks to my dad for being our photographer! Sometimes I get sick of looking at pictures of me by myself over and over again, so I loved mixing things up and having them join me in a few shots! We all love Free People! Cowl Neck Pullover- This is one of those sweaters you get your money's worth out of. It's so comfortable and a great length, so you can wear it with leggings or skinny jeans. I have my eye on this blue one and this oatmeal colored one. 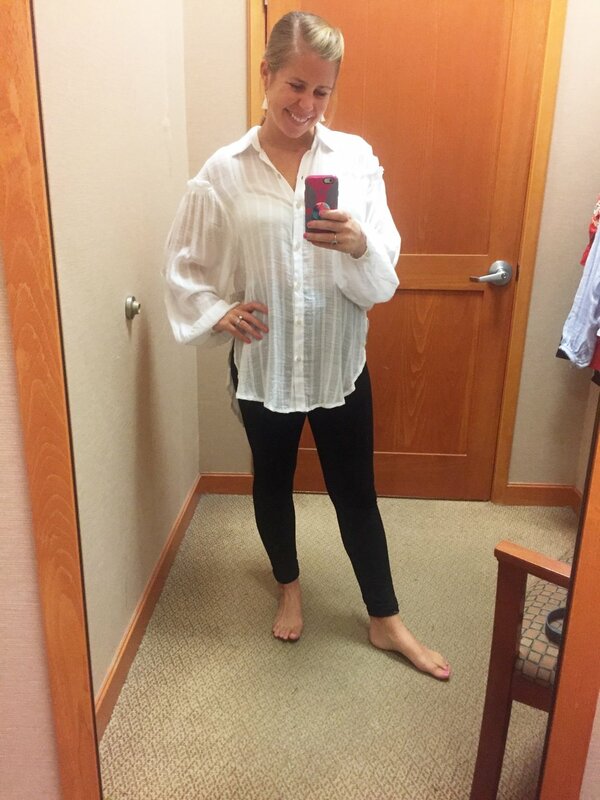 I shared my number 1 favorite Free People top yesterday, but this one is in my top 3 favorites! Thermal Top- This is my newest top from Free People, and I love it! It is also in my top 3 favorites. It comes in 9 colors, and I want them all. I clearly have a thing for long tops I can wear with leggings, and this one is perfect for that. It also has thumbholes, which are always fun! I kinda bunched my sleeves up for the first picture, but you can see what they look like in the second picture! Also, they only had a large in the store, so you can see in the second picture that sizing up makes it a much slouchier fit. Some people prefer that. However, I went with the medium, and it is less slouchy but still flowy! 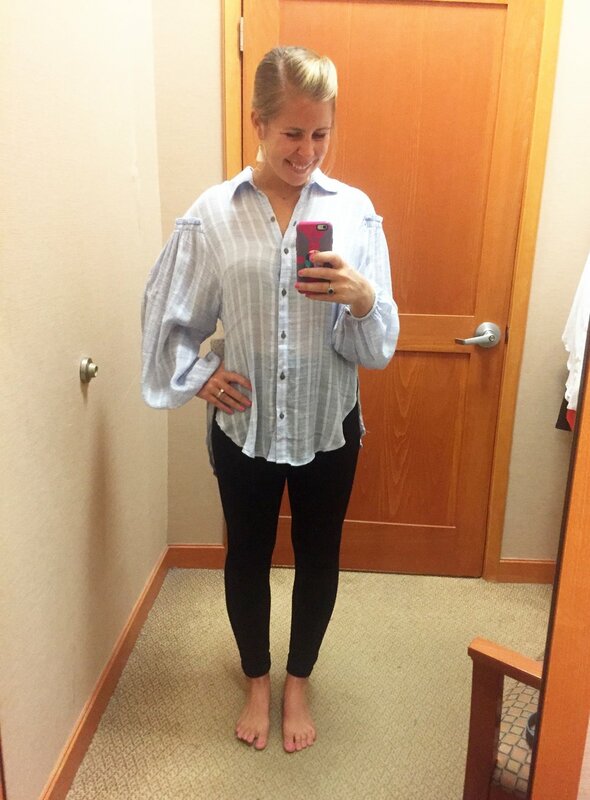 Button Front Blouse- I tried this top on a few weeks ago and loved it immediately. It is a classic button down shirt with a fun twist thanks to the sleeve details and cute hemline! I've had 3 people ask me to find clothing that is appropriate for work but also normal-looking for after work, and I have to say this top is the winner! Perfect for work and play! I love versatile pieces like this one! Plaid Tunic- I discovered this top during the big Nordstrom sale, and it sold out so quickly. I grabbed this blue one and the peach one because it is such a great plaid top with cute buttons down the sides. I saw where it came back in one size, so I linked it up. However, I'm scared it's going to be sold out again soon. If you ever see it in stock again, grab it!! This is my favorite plaid top I've ever owned. Hooded Pullover- My mom found this top, and it is the perfect, cozy pullover. It runs really big. Size down one size. There is a lot of fabric, but we could not love it anymore! 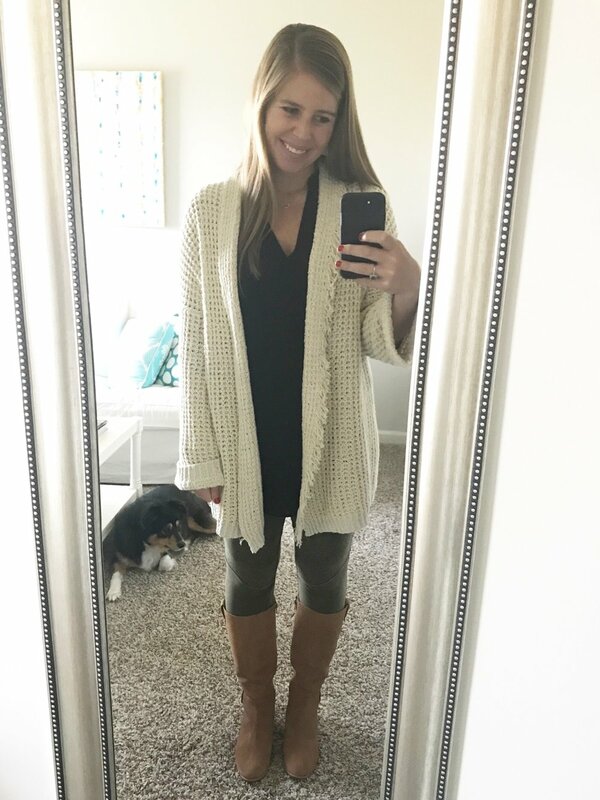 Silk-Blend Cardigan- This cardigan was the It Cardigan last year, and we waited until it went on sale and grabbed it a couple months ago. It is still on sale! My friend Emily and I picked it up in the pretty green color at Nordstrom Rack yesterday. More to come about that tomorrow! It is also available in select sizes and colors here and here. I'll leave you with one final group picture, as well as the Free People top I will be buying next.. my mom's shirt! It is another 0ne of those versatile tops that is adorable for work and play! Or click here to check out more beautiful items on the Free People website. Thanks so much for reading my Free People posts! Free People is a brand I truly love, so I am happy to share all about it. Have a great day!